Why isn't there a Mars topic here? Evidence, apparently, of liquid water on the surface of Mars. And then this today! "The Martian Chronicles" are coming to us better than any Hollywood producer ever could have captured it. God Bless Mr. Bradbury! He must be cherishing every moment of the new discoveries. i have heard that if they prove there was once an ocean on mars that Long John Silvers is planning to give a jumbo shrimp (6 inches or larger) to every american. this information must be proved by the ides of march (march 15) for Long John Silvers to carry this out. IMAGINE! a jumbo shrimp for every american! i don't know if this is true, and i will be in hawaii on the ides of march! i don't think there are any Long John Silvers there! true or not it is fun to think about those gagillions of shrimp Silvers might have to pass out. Well, we better all start lining up then! Study this carefully for a few minutes, think of/like Spender. What do you start to see? Very interesting, indeed. I'm curious to see if the "thread-like" object seen in one photo will be seen elsewhere. It could be detritus from the kevlar bags that cushioned the rover. But if they find them again, far away from the landing site, that leaves open other possibilities. 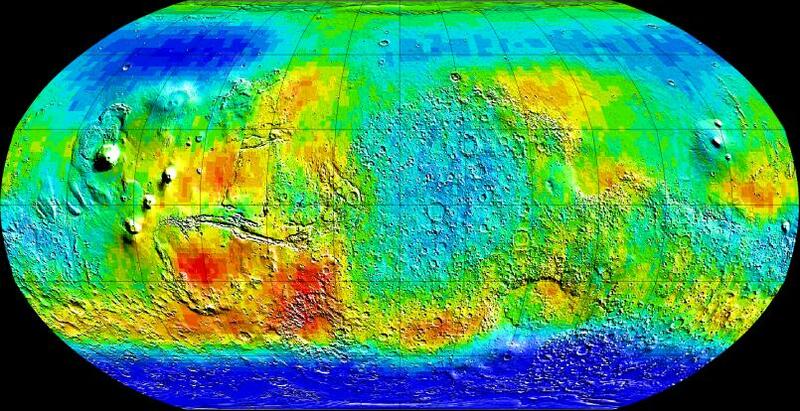 Ray's Mars might be more real than we had thought. I am the last martian. A good film version of the Martian Chronicles needs to be made before man lands on Mars. We know the respect that this great mysterious planet deserves (not to mention our own planet) but the story needs to be done justice on film so that all the non-readers can appreciate the importance of that respect. Here's a good link. Various possible shots of what Mars may have looked like with lots of liquid water. Any amateur astronomers here? Mars looked great last Friday and Saturday from my univerity's observatory. For those who haven't done it before, I suggest you take a look at it yourselves. It's just fantastic. Lots of cloud cover down here in Oklahoma lately. Next time it's clear, I'll take a gander. I had occasion to view Mars in the summer of 2003 at its nearest approach to the Earth in some (they say) 60,000 years through my 11 inch Celestron GPS telescope, which I had taken up to Griffith Park on a field trip with others from astronomy clubs in the LA area, so that others could also enjoy the view. It was not the best viewing from that location, but days later from my home in Laguna Hills, it was just spectacular. If you have seen the pictures of Mars taken by the Hubble telescope, you might recognize a familar outline in the dark features set against the planet's lighter and redder surface: "Bullwinkle" lives on Mars! The European Space Agency's MARS EXPRESS is taking some great real-color photos of Mars from orbit. If these are true color photos, why is there green and blue-green in some of the deep valleys? Is this just photo anomaly, or effects of thicker atmoshphere in the trenches?